Last night as I was falling asleep, I had an interesting idea - to add an FAQ to to my blog. And since I woke up still thinking about it, I say HECK YA, let's do this thing! If you have a question that I didn't answer - ask in the comments and I'll answer! What camera do you use/ should I buy? I'll also add that as I get more and more into film, I'm not even convinced Digital SLRs are all that. There may be a day when I have my Fuji X10 (or whatever little rangefinder type electronic camera has manual focus, because that's the one feature I'm looking for still in a small camera) and a film SLR/ medium format camera. This hasn't happened yet - and I still adore my Sony a580 - but yeah. I could see it happening. The only thing that keeps me from doing that is the additional expense of getting film developed. I actually bought into the Sony system because the lenses can be used with the Minolta (film) system (and vice-versa). What is up with all the selfies? Especially the double exposures, those are weird! I'm doing a self-portrait 365 project. 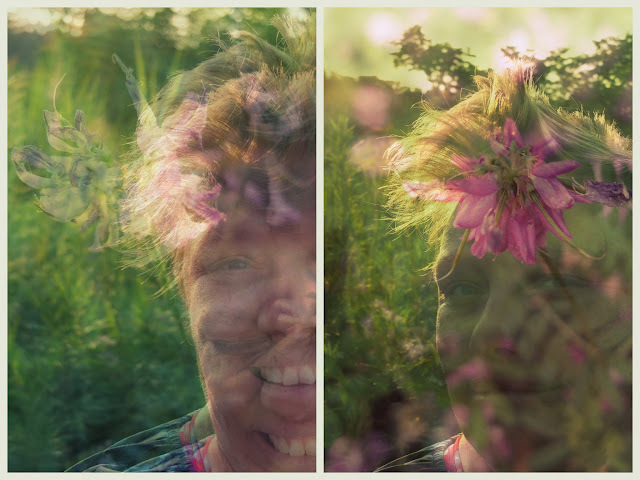 I like the double exposures, they make me happy. I'm a poet! Where should I publish my poetry? I honestly have no idea. I don't really send my poems out, I publish them here (and no, I don't do guest posts, this is 100% my blog). I can prompt you to write more in my ecourse, the 52 Weeks Poeming Project, but I have no idea where you should send them, sorry. What the heck is an ecourse? It's an online class. Lessons are sent out via email or accessed on a private blog/ community message board/ Facebook group. Why did you dreadlock your hair? And why did you shave it? Because I wanted to dreadlock it and then because I wanted to shave it! Seriously: I have always loved the aesthetic of dreadlocks and after I had Remy at home, I realized I didn't need to follow anyone else's rules about what I should or shouldn't do. And that included shaving my head when it was time to let the locks go. You had a homebirth? Why? Isn't that dangerous? Yes, I totes had a home birth! Remy was born in our bedroom. It was a totally normal birth and his apgars were great (i.e., he had no distress - compare that to my own birth, which was an emergency c-section because of fetal distress). Planned home birth is no more dangerous than hospital birth, statistically (and in fact, a long term study in British Columbia, Canada where home birth is encouraged, shows it is statistically safer in many ways). We found out when Remy was three and a half that he had had a (most likely) perinatal 'stroke' before or after he was born. We have no idea when exactly (because there was no outward symptoms of it happening), and one of my husband's neuro-psychology colleagues assured us that it was probably during fetal brain fold development. Remy had (and still has) a language delay and social issues but he's the most awesome kid I can imagine. I've also had one abortion and one miscarriage and refer to those children as my "waterbabies." This is my translation of the Japanese term mizuku (the direct translation is "water child"). Why do you use Japanese terms? Do you speak Japanese? I don't speak Japanese at all, sadly. I tried taking a course in university and dropped out after the first class because it was really intimidating. I love and respect Japanese culture (beyond sushi). This probably comes in large part from my study of Zen. Wabi sabi is one of my favorite concepts (for a long time, this blog was subtitled "this wabi sabi life"). No. I'm a very liberal, Reconstructionist Jew. My journey away from paganism is a long story. Suffice it to say, it wasn't my path. Although I found the idea of feminine deities very appealing, I'm just not a believer in pantheism. I love goddess (and god) archetypes and myths but I don't believe in them. Big difference! I converted to Judaism in my mid-twenties after marrying my b'shert. In Judaism, I found a home for my questioning soul. In Judaism, I found a place for my paradoxes - my strong belief in the Oneness of Everything (one g-d) - and my just as strong belief in the fact that I don't know (which one might call agnosticism). In Judaism, I found a home. I continue to read Buddhist writings and meditate. I grew up meditating in more of a transcendental meditation style (putting oneself in a trance state), but as a teenager I read the writings of Thich Nhat Hanh and from then on, my meditation style has leaned more towards mindfulness/ zazen. I do collect Buddha statues (and post a lot of photos of them). Why? I love them. They are like meditation bells for me, a reminder to be still. A reminder to be mindful. I also still read tarot cards, chakras and auras occasionally. Why? Because that's how I was raised, I guess. I'm skeptical but I'm also trained in the hows of all those arts. So... yeah. I don't know, it works for me. Who is M and what does he do? M is my husband's blog-nickname. He prefers not to be written about and I honor his request. Broadly speaking, he's a cognitive scientist. He is the love of my life, my soul mate, my b'shert, my beloved. We met when we were 19 and in August, we'll have been together for half our lives. You seem so upbeat and cheerful. Are you really like that in person? How is it possible you struggle with depression and anxiety when you seem so happy? I am upbeat and cheerful, online and in person. That's just my natural personality (I'm bubbly and happy). I've probably gotten more serious since I became a mother (because: rules/boundary setting), but I think I'm still funny. I really like telling jokes and making people laugh, but I think most people only recognize I'm trying to be funny when I'm drinking. I don't quite understand why, but I've had a few people comment about it. Perhaps my sense of humor when I'm not drinking is more dry than most Americans. I make myself laugh all the time! I also have a strong social mask - because my personality is naturally happy, even when I'm sad or depressed, I maintain that, socially. It's difficult for me to let people know (in real life) that I'm struggling. Part of my practice is to work on being transparent and write (and talk) about my struggles. Sometimes that is easier, sometimes it is difficult. I haven't had a really bad bout with depression since I began writing here every day (my last big struggle was with post-partum depression, which was in large part sleep deprivation) but I still struggle with hormonal issues and seasonal affective disorder (SAD).